On Sunday October 14th we will be going on a beautiful fall colours tour. This is a great way to end a wonderful season. We will be starting from Mono Plaza on Highway #10 at 9:00am and stopping for lunch along the way. Hopefully there will still be leaves on the trees. 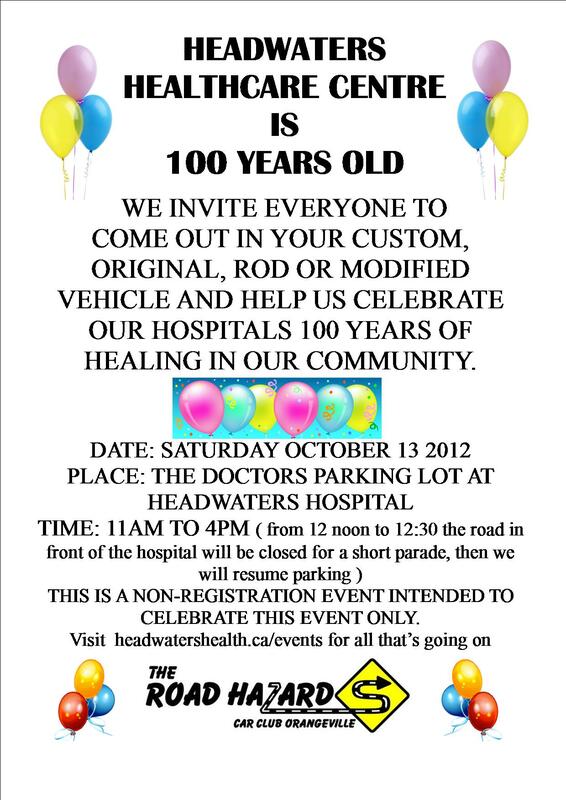 Headwaters Healthcare Centre is 100 Years old! As part of this celebration the Road Hazards are organizing a car show to be held in the doctors parking lot at the Headwaters Hospital on October 13th from 11:00am - 5:00pm. For more information you an visit the official Headwaters Health Care Centre events page or download our flyer. DASH PLAQUES & GOODIE BAGS TO THE FIRST 150 REGISTERED VEHICLES! We need volunteers to help run the show and donations for the prize table. This is the time for "re-gifting". Please drop off any door prizes to Loraine at the table at the nest cruise night. Thank you in advance! Our last cruise night for 2012 will be on Wed. Sept. 5th. We will be providing FREE coffee and donuts. The CLUB GENERAL MEETING will be on Wed. Sept. 12th. We ask that you try to make it out for this if you can as there are things that must be discussed and decided on. Your imput is very important to us, and YES there will be coffee and treats provided. The Blues Cruise is coming up soon (June 1st) and we need your help. We need volunters and helpers reader to go at 4:30pm to about 7:00pm. By that time the rush is over, but we then need people to help out on relieving people on the gates and the tables. Please confirm that you can help by contacting us. Thanks. It looks like it will be a fantastic show so don't miss it. Once again membership is only $20.00 for the year. After you register you will receive a fantastic club T-Shirt and our newsletter. The easiest way to join is by visiting the prize tabe when you join us on our Wednesday night cruise in the Canadian Tire parking lot. The last newsletter for all of last years members was sent out back in April. If you want to make sure you keep receiving them please remember to renew your membership when you join us on a Wednesday night cruise in Orangeville. Hi everyone, I hope you like the new web-site. It is still a little bit in the "Bare Bones" stage but we plan on filling it with content over the summer. We will also be posting video content on our YouTube Channel and provinding more club news in our "Video BLOG" coming soon. This year we will also be using Twitter as another way to keep members and the community in the loop with club news.